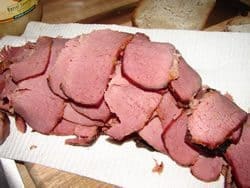 Today we are talking about a subject that is dear to many people's hearts and super easy to do.. Pastrami. 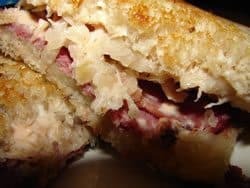 This may not be exactly the same as the pastrami or reuben that you might find in a New York deli but those of you who know me, know that I am all about getting out of the traditional box and doing things a little different. For this recipe we will be slow smoking a corned beef brisket from the store instead of curing our own beef. 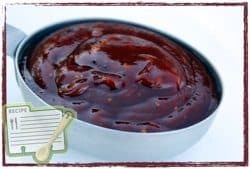 This works perfectly for home and is great on a sandwich as I will show you later. Pastrami in it's most basic form is simply a process by which turkey or beef is spiced, brined, smoked and sometimes steamed for maximum tenderness. The resulting product is normally placed on some type of rye bread with slaw or sauerkraut and provolone cheese. 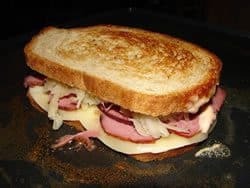 There are many variations and ways that pastrami is made and served in the United States and abroad but my favorite is the traditional smoked corn beef brisket served on Jewish rye bread with rinsed sauerkraut and thousand island dressing.. can you say delicious!!? 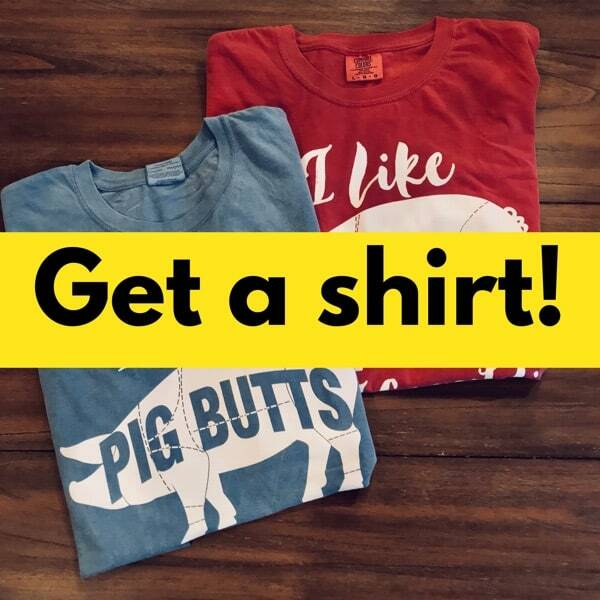 Although you can be a purist at heart and do all of the brining of the beef brisket yourself at home, It is also okay to take a shortcut and just purchase a corned beef brisket for this task. 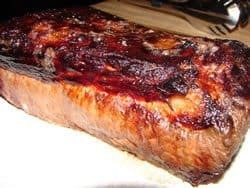 For this recipe, I purchased a three pound corned beef brisket. After removing the brisket from the package, rinse the meat well and set it aside. What if I Don't Want it So Salty? 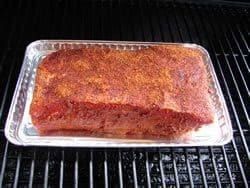 You must know that the corned beef brisket is very salty at this time and if you prefer less salt, it can be soaked in fresh water for several hours to leach out some of the salt. 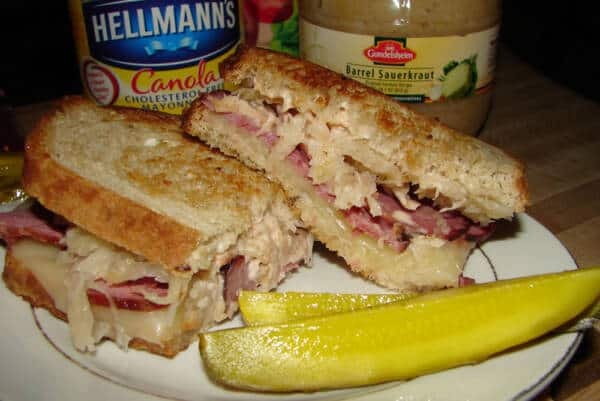 In my opinion, this is not necessary since the sauerkraut is rinsed, the provolone cheese is not salty and the Jewish rye bread is fairly bland.. it all balances out in the end. About 4-6 hours of soaking should be plenty for a normal 3-4 pound brisket if you decide to soak it. Change the water a couple of times during the soak and make sure to keep it cold in the fridge during this process. 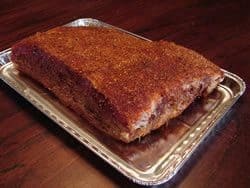 After adding a thin layer of Dijon mustard to the brisket, I made up a batch of my original rub* and sprinkled it generously on all sides. 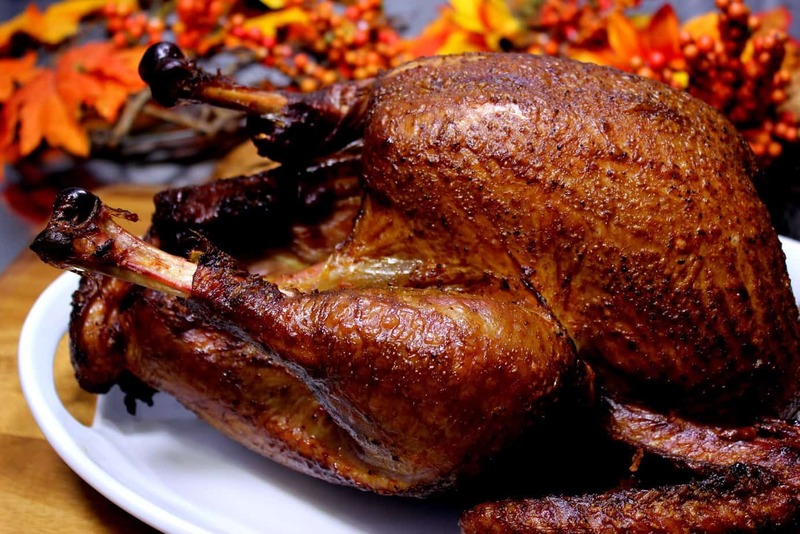 The mustard will introduce a great flavor along with the rub. 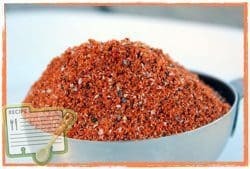 You can add a tablespoon of coriander seed if you like, this is a common spice for pastrami. 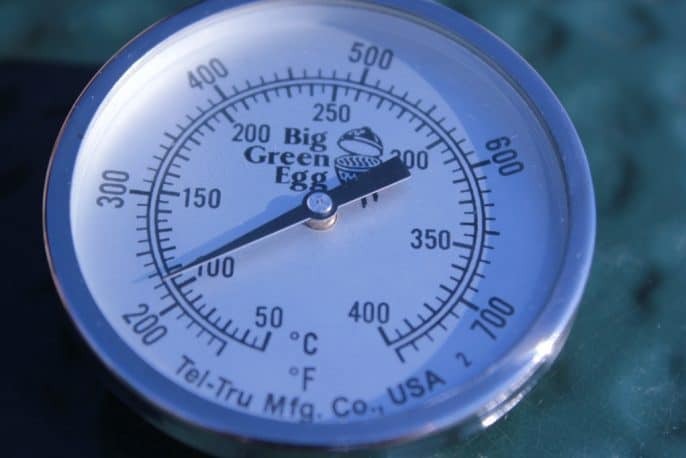 At this point you will need to go out and prepare the smoker for 225-250°F. This is true whether you are using charcoal, gas, electric or wood. Many folks recommend a very mild wood, I like to use mesquite which is far from mild. You will have to use your own discretion on that. 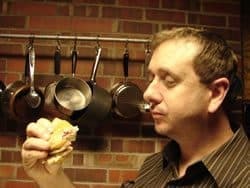 I like to really taste the smoke and I feel that the saltiness of the meat masks the smoke flavor unless I use something a little more robust. It would also be good with hickory, apple, pecan or cherry in my opinion. Like a normal brisket, you can expect the cook time to be fairly extensive. I did a couple of these in getting ready for this newsletter and the first one took nearly 8.5 hours.. it was only a 3 pound brisket. The second one took right at 10 hours but was a tad thicker (same weight). 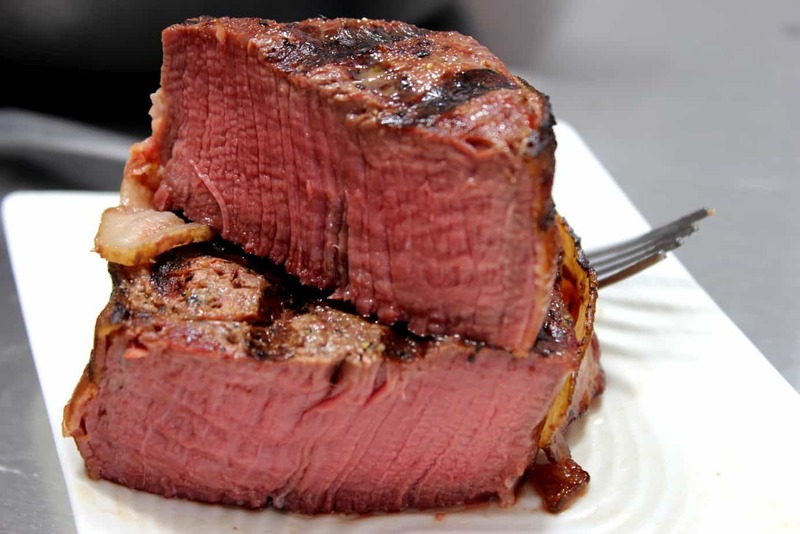 Lots of folks try to determine cook time by poundage however, the time is more relative to the thickness of the meat. 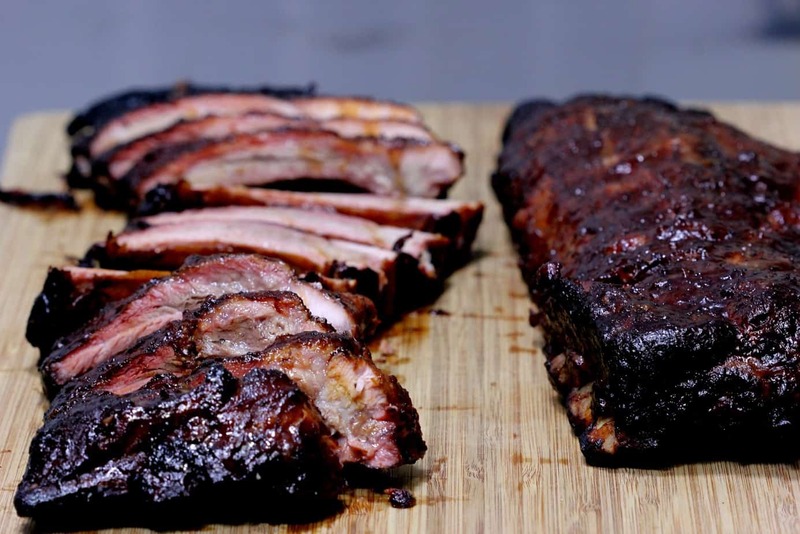 A brisket 3 inches thick, 6 inches wide and 8 inches long should cook in about the same time as an equally thick brisket that is twice as long and twice as wide. poundage is relative but you have to realize that the thickness plays a much larger part. For this reason, the temperature of the meat needs to be the determining factor for when it is done.. not the time. We try to estimate the time for planning purposes but that just does not always work and you have to be prepared to give it as long as it takes if more time is required. 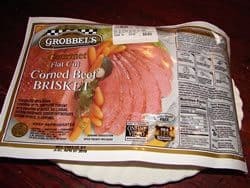 I opted to place the corned beef brisket on a small aluminum tray for ease of mobility but you can just as easily place it directly on the grate. If you are using charcoal, gas or electric, then apply smoke for at least 4 hours making sure that the smoke is being well vented.. i.e. it can easily escape from the smoker. 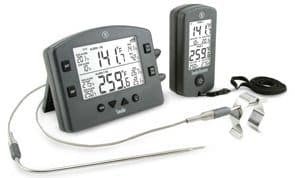 After this time of applying smoke, you can simply continue with the heat until it reaches an internal temperature of 190-200°F. I know many folks only cook the brisket to about 165-170°F when making pastrami but in my opinion this is not enough. Once the brisket reaches the desired internal temperature, it can be brought into the house for cooling. I recommend letting it rest for 30 minutes to an hour then place it in the fridge until it gets cold. It is so much easier to slice when cold. I usually put it in the fridge overnight and use my meat slicer the next morning to slice it up into 1/8 inch thick pieces. 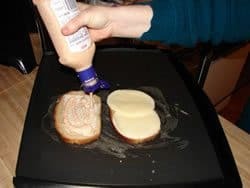 Put mayonnaise on two slices of bread. 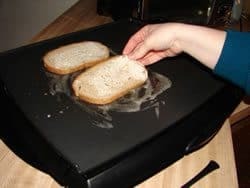 Grease a 300°F griddle with butter and lay the slices of bread face up on the griddle. 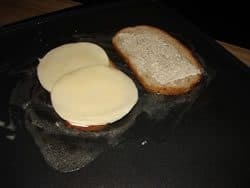 Place a couple slices of provolone (or swiss if you prefer) on one slice of the bread. Squeeze some Thousand Island dressing onto the other piece of rye bread. Layer the pastrami on top of the cheese so it covers the entire sandwich. Once the cheese is melted and the pastrami is hot, place a large helping of sauteed sauerkraut on top of the pastrami. (Instructions for sauteed sauerkraut below). I recommend purchasing a large 26 or 40 oz jar of sauerkraut (homemade would be even better). If the sauerkraut is really sour you can rinse and drain it to make it a little more mild flavored..
Saute one small chopped onion and one TBS of minced garlic in olive oil over medium high heat until the onions and garlic are tender. Add sauerkraut and saute it together with the garlic and onions for 5-6 minutes. Season with 1/2 tsp celery seed and add salt and pepper to taste. 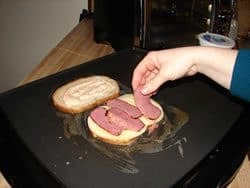 Top the sandwich with the other slice of bread. Cut the sandwich in half if you like and garnish with a pickle for a really great lunch or anytime meal. A close up to show the melted cheese, sauerkraut and meat all combined into one juicy and delicious sandwich. Here I am taking a huge bite of the sandwich.. it was so good!! What About that Steaming Process We Mentioned Earlier? 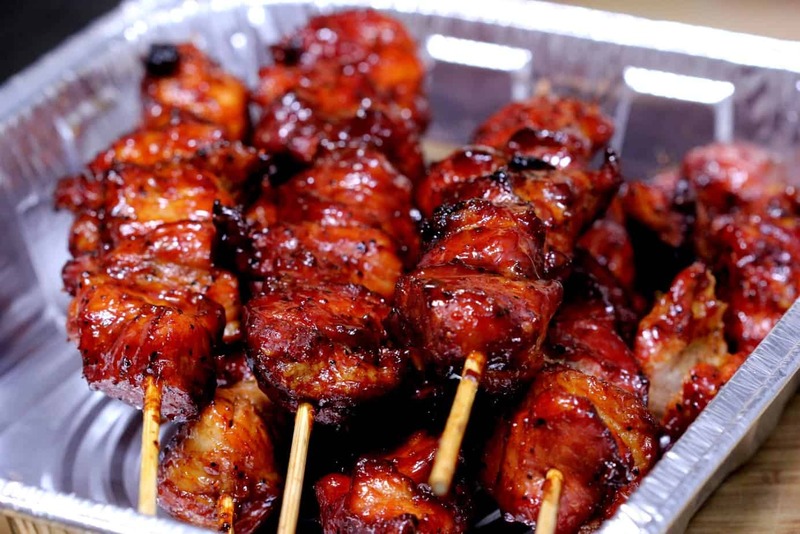 By cooking it to 190-200 degrees, the steaming process to make it tender is just not necessary. 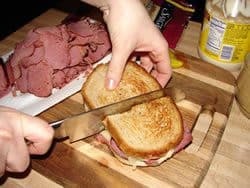 It is tender and delicious as is and can simply be warmed in the microwave, eaten cold, pan fried like bacon, or put on a sandwich just to name a few of the many delicious ways you can enjoy your very own homemade pastrami. 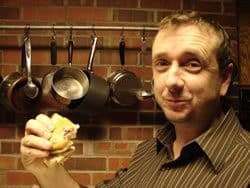 Hello,enjoyed your article on smoking corned beef. The one point which was not addressed is to smoke it with or without the fat cap, I can see pro/con for either. 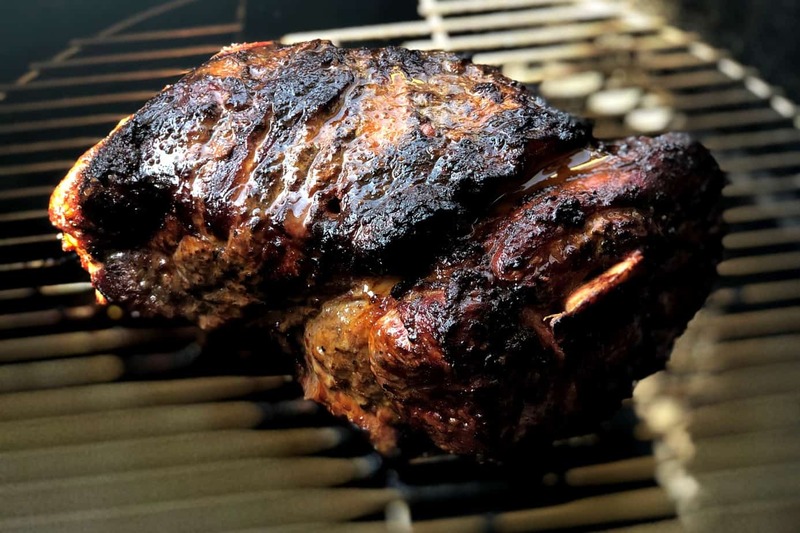 My gut feeling is to remove it thus exposing more direct meat to the seasoning rub thus giving a more robust pistrami flavor….your thoughts. I have two store bought corned beefs in the freezer and I will try smoking one of them. I’ve read your articles and viewed your photos (I should never view your site on an empty stomach, I’m about to chew my arm off right now). 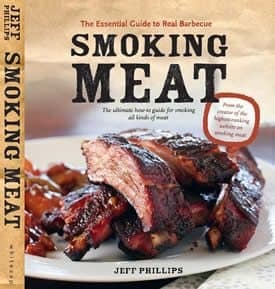 My question is: Why is there no smoke ring on the meat when sliced? I’m doing Pastrami, there are two 1.4kg briskets in the smoker, and I’ve been smoking at 250*, because all my previous meats have taken longer than the expected time. 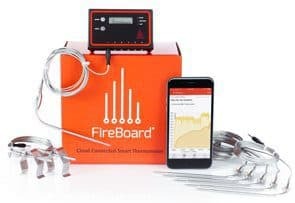 I’m only 4 hours into the smoke, and my internal temps are already at 168* and 165*.. I feel like it’s going FAR too quick now, have I made a crucial mistake?? Laura, I think it will be fine. Even if it did happen to get done early, you’d just wrap them in foil and then a couple of thick towels. Place that into an insulated cooler and keep them until you are ready to slice them up. Normally you will see a stall when the meat reaches 160-ish where the temperature just stops climbing for several hours. This may still happen as well. 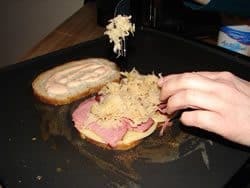 One thing that I do to speed up the sandwich making process is to cook the sauerkraut and pastrami directly on the griddle while the cheese melts on the bread. It makes sure the contents are piping hot without burning the the bread. I’m curing a 13 pound brisket in a 3 gallon brine to make a pastrami and using prague powder #1. This my first time using the curing salt. The brine called for about 2 and half cups of salt for the 3 gallons of water. I substituted the curing salt which was about 14 oz. I understand that the curing salt is primarily salt, over 90%, but is using this in what I have now learned is a disproportionate amount going to have a bad effect on the pastrami? Mayonnaise on pastrami? You lost all credibility. The mayo was only to brown the bread. He used thousand island. The wife picked up a corned beef that was short on code and cheap on price. She gave it to me and said, do something with it..soaked it and rinced it twice in 12 hour. Yellow mustard, Jeff’s rub. WOW, course pepper is the trick. Smoked it six hours. Double wrapped into foil, into oven and finished it to 196 degrees. Let is cool. Fridge over night and put on slicer next day. Unbelievable taste. I put the rub in the blender to make it into a powder before I added the pepper. Best rub I have even tried. Ps. Turkey breast came out so moist my wife thought it wasn’t done. I make a pastami suasage. 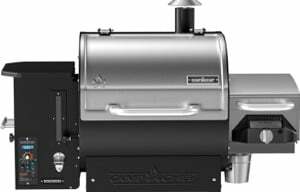 I use a meat grinder and grind the store bought corned beefthen use my sausage stuffer and fill my casings them smoke with hickory wood chunks for about 5 hours. I found out it’s best to let the sausage set up in the refrigeratorfor a few days for a better texture reheat and it’s ready eat. 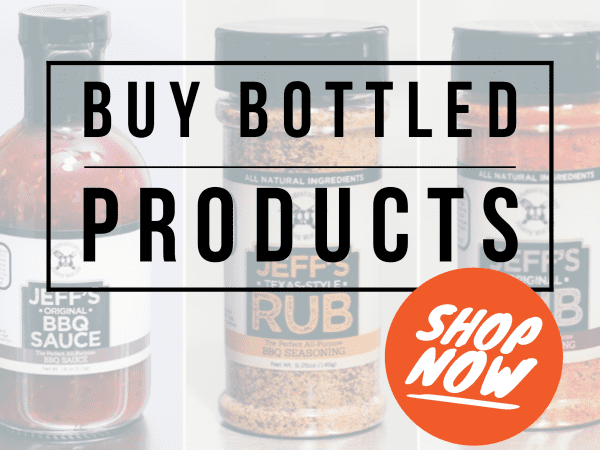 You need to purchase Jeff's rub and sauce recipes using this link http://www.smoking-meat.com/order. I purchased them and definitely think they are worth the money. 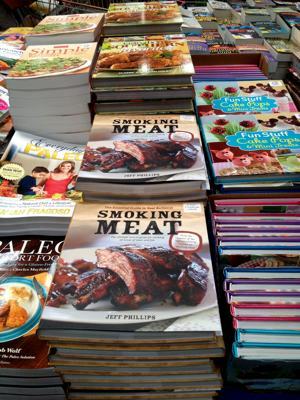 I've also since purchased his book, which has some great recipes that aren't on the site.